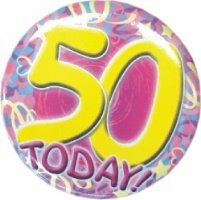 The Dreamcast Junkyard: 50 Today! You may recall a few weeks ago that I told fanciful stories of a not-to-distant land that goes by the name of 'Salford.' Tis a strange place full of rat faced children who roam the destitute and derelict streets looking for elderly people to harass; and drunken louts who enjoy nothing more than throwing bricks at you if you look in their general direction. It's also home to the mighty Manchester United, so it's not all bad. TWELVE POUNDS AND NINETY EIGHT PENCE!! What the hell can you get for £12.98? 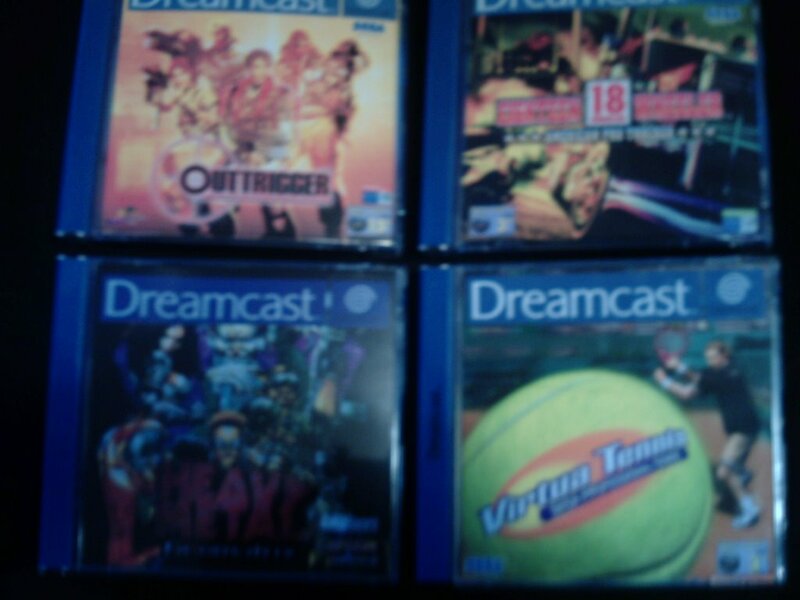 Not a lot in this day and age...but I got four awesome Dreamcast games, all in literally brand new condition. They had many more games too (Record of Lodoss War, Street Fighter Alpha 3, Jo Jo's Bizarre Adventure, Zombie Revenge, MDK2, GTA 2, Giant Killers...), and I'll be back there next week without a doubt. 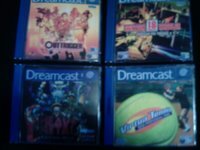 But the reason for that title is simple - today's buy has brought the Dreamcast Junkyard's total number of games up to a mind splintering 50! Oh, and nice deals on the games! I'm also a bargain hunter myself, and I like my games nice and cheap. I think I might be done with my DC collection though... Not much more I can think of that I want to play on it. Is Sonic Shuffle any good (if you've played it)? I'm a big fan of Mario Party. Ross - I've heard very bad things about Sonic Shuffle...it wasnt developed by Sega you see. You'd probably do best to avoid it at all costs if you want to play it...but if you just want it in your collection for the sake of it, it's quite sought after. Gagaman - I know, how lucky was I?! That branch of Gamestation is unbelievable. It was like walking into heaven!! Our branch down here in Southend is rather lousy, but the one up in Balsidon quite often has some nice bits (it's where I gots me lightgun set recently for £20 with Phantasy Star Ver.2 thrown in). Stop your silly over budgetry shennanigans (that word is now owned by Guinness), and get down to some serious patronage of St. Holt! Since I really don't know any St Patrick, and believe that Guiness is an almost decent-cheapish beer, I'll ask you one thing Tomleece: Are you a Man Utd fan? Gnome - Yeah, Im a United fan. Have been since the dawn of time...and I live about 20 minutes away from Old Trafford - the theatre of dreams (or nightmares if you take into account the last few seasons! ).